2012 Reissue - 180 Gram Audiophile Black Vinyl. That Leather Glove. That Bum. 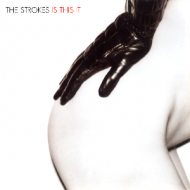 One of the most recognizable and celebrated record covers from the noughties. Critics and audiences alike were blown away by the gargantuan success of the 2001 debut-album of this New York quintet, and we're still recovering from the aftershock ten+ years later. Drawling vocals, bouncy basslines, gnarly guitar riffs, and a steadily chugging beat made "Someday" and "Last Nite" the anthems of a new generation. So put on your skinny jeans, tousle your hair, and find yourself a model; Is This It will make you feel like the coolest kid on the New York block!